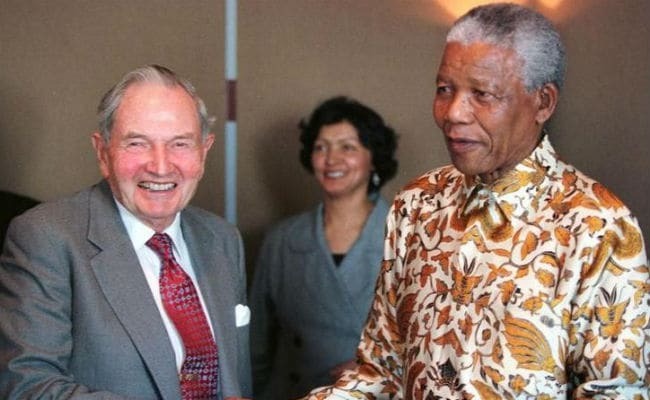 File photo of David Rockefeller with Nobel laureate Nelson Mandela. New York: Billionaire philanthropist David Rockefeller, a former head of Chase Manhattan bank and a luminary in political circles, died on Monday at the age of 101, a spokesperson said. He died in his sleep due to congestive heart failure at his home in Pocantico Hills, just north of New York City, spokesperson Fraser Seitel said. The last living grandson of Standard Oil co-founder John D Rockefeller, Forbes magazine ranked David Rockefeller 581st on its annual list of billionaires released on Monday, estimating his fortune of $3.3 billion. He led Chase Manhattan, now part of JPMorgan Chase, in the 1960s and 1970s, and his accomplishments included opening the first Moscow offices of an American bank and the first in mainland China after US President Richard Nixon's 1972 visit there. He also oversaw the growth of Chase Manhattan's operations in the Middle East, Latin America and Japan, Seitel said. Rockefeller also was well known in political circles in the United States and overseas, where he encountered heads of states from close to 100 countries and was known as an outspoken champion of American capitalism. He was offered the post of Treasury secretary by presidents Jimmy Carter and Richard Nixon, but turned both men down, the New York Times reported. Rockefeller famously helped persuade then-president Carter to allow the shah of Iran into the United States for cancer treatment in 1979. The move was widely seen as spurring the Iranian revolution led by the Islamic fundamentalist Ayatollah Ruhollah Khomeini. Born in 1915, Rockefeller grew up in a mansion in Manhattan and attended Harvard College and then the University of Chicago, where he received a PhD in Economics. He enlisted in the Army and served during World War II in North Africa and Southwestern France. The French government awarded him the Legion of Honor with the rank of Chevalier in 1945. Rockefeller joined Chase National Bank in 1946 as an assistant manager in the foreign department before subsequently overseeing the bank's business in Latin America. He became co-chief executive in 1961 and later sole chief executive before retiring in 1981. Rockefeller, along with brother Nelson, who was governor of New York state and later vice president under Gerald Ford, helped lead the development of the World Trade Center in the 1960s and 1970s in lower Manhattan. The Twin Towers were dubbed in the press "David" and "Nelson." The move continued a family tradition that had included the family's efforts to spur the building of Rockefeller Center during the Great Depression. Among his other most important civic roles, Rockefeller served as chairman of the Council on Foreign Relations and executive committee chair of the Museum of Modern Art, which his mother founded. Rockefeller Foundation president Rajiv Shah said in a statement "the world has lost a great man and philanthropist." Former president George HW Bush praised Rockefeller as "one of the most generous philanthropists" whose "keen aptitude for issues made him a valuable advisor to Presidents of both parties - yours truly certainly included." Former president Bill Clinton hailed Rockefeller as "a consummate businessman, a great humanitarian, and a serious scholar." Rockefeller's grandfather was one of the original American "robber baron" tycoons of the 19th and early 20th centuries, employing brass-knuckles business tactics to build his oil empire before the US Supreme Court ruled in 1911 that his Standard Oil company should be broken up. Today's oil giants, including ExxonMobil and Chevron, are descendants of Standard Oil. Ironically, Rockefeller philanthropic organisations have strongly supported action on climate change policy, putting them at odds with oil companies like ExxonMobil. They also provide financing to research and journalism groups that accused the oil giant of knowingly supporting propaganda questioning the science of climate change. The Rockefeller family has been active in philanthropy since patriarch John D Rockefeller, who funded medical research and higher education programs. The Museum of Modern Art, Rockefeller University and Harvard are each expected to receive some $100 million upon the death of David Rockefeller, according to the magazine Inside Philanthropy.